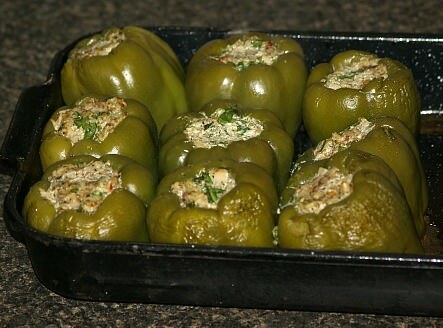 When I first learned how to make stuffed peppers, it was only using green bell peppers. This is what I grew up with so it is all I knew. Did I ever have a lot to learn! I often saw the red, yellow and orange bell peppers when I purchased the green ones. These colors are so pretty so I had to find ways of using these also. I quickly learned that these made great appetizers when stuffed with different types of cheeses. Since I was very young, I was quite familiar with hot banana peppers. I never learned how to make stuffed peppers with them but everyone in my family loved them. Dad grew a lot of these peppers so we ate them raw on sandwiches, chopped in all kinds of dishes and Mom would can them. I figured that this pepper had to taste good when stuffed and I was right. You can use any pepper stuffing, rice, cheese, meat, seafood or whatever to fill banana peppers. It was after I moved to Florida that I was introduced to many of the Mexican peppers. This was a great discovery for me. I love the wonderful seasonings in Mexican food. There are so many good Mexican restaurants in Florida. This is how I got hooked on the Mexican peppers. Chiles Rellenos is my favorite dish in any of the Mexican restaurants. I just had to learn how to make stuffed peppers this way. When learning how to make stuffed peppers, try mixing different stuffing recipes with different types of peppers. As I said with the banana peppers, you can use any of the fillings. When choosing peppers to stuff, make sure the pepper is big enough to fill. Some are so tight and skinny that it would be awfully hard to put stuffing in them. Pick peppers that appeal to your taste buds. If you do not like hot spicy foods then you should stick with the sweet peppers. Let me tell you, after cooking, these hot peppers become “fiery” hot. Place peppers, tomatillos and onion slices on broiler rack. Broil until blisters appear on peppers and tomatillos and onion are browned about 5 minutes on each side. Place peppers immediately into a zip lock plastic bag; seal and refrigerate at least 8 hours. Place grilled onion and tomatillos in an airtight container and refrigerate 8 hours. Peel peppers, remove and discard seeds; set aside. TO MAKE SAUCE combine in food processor the tomatillos, onion, garlic, salt, pepper and cumin; process until smooth. Stir cilantro into sauce; set tomatillo sauce aside. TO MAKE CHILE RELLOS combine black beans and cheese; spoon into peppers. Beat egg white on high speed until stiff peaks form; gradually beat in egg substitute. Coat stuffed peppers with flour, dip into egg white mixture, lightly recoat peppers with flour. Coat a large heavy skillet with cooking spray; add oil and heat. Cook peppers in the hot oil on both sides until lightly browned; serve immediately with tomatillo sauce. Learn how to make stuffed peppers with the delicious combination of sausage and rice. Cut tops from green bell peppers; remove seeds, wash and set aside. Combine remaining ingredients; blend well with clean hands. Stuff green bell peppers; place in a lightly oiled shallow baking pan. Bake about 60 minutes until sausage is done. NOTE: If needed lay a piece of foil over top the last 15 minutes to prevent over browning. When learning how to make stuffed peppers jalapenos are a favorite for appetizers. WEAR RUBBER GLOVES and cut ½ inch slit lengthwise in each pepper and remove seeds. In a medium bowl combine cheese, shrimp, green onion, bacon, garlic, salt and coriander; mix well. Stuff each jalapeno with 2 to 3 tablespoons of the shrimp mixture; place on baking sheet. Bake until cheese is browned on top 20 to 30 minutes; sprinkle with lime juice before serving. Drain peppers reserving ¼ cup of the liquid. Cut peppers in half lengthwise; remove seeds and pat dry on paper towels. Combine reserved pepper juice and the cheeses; spoon mixture into pepper halves. 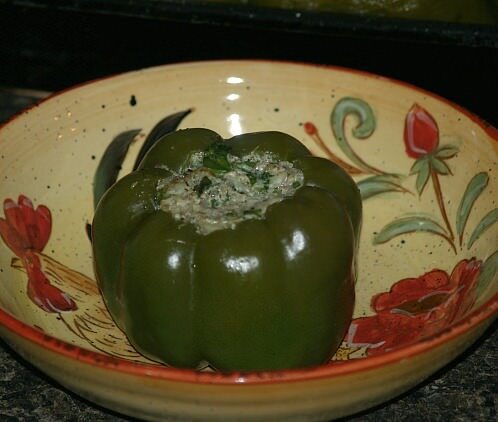 Roll peppers in ½ cup flour to coat; place on baking sheets, cover and FREEZE 1 hour. Combine and blend the eggs and milk; mix together ½ cup of flour, cornmeal and seasoned salt in shallow dish. Roll stuffed pepper halves in remaining ½ cup of flour; dip in egg mixture and then dredge in the cornmeal flour mixture. Pour about 3 inches of oil in a Dutch oven; heat to about 350F degrees. Without crowding fry peppers in hot oil until light golden brown about 4 minutes. When learning how to make stuffed peppers, bell peppers can be stuffed with many different ingredients. Trim off tops of bell peppers and remove seeds; precook peppers in boiling water for 5 minutes. Brown meat and onions; add tomatoes, rice, Worcestershire sauce, salt and pepper. Cover mixture and simmer until rice is tender; add cheese. Drain peppers and stuff with meat mixture; stand upright in baking dish and bake 25 minutes uncovered. Preheat oven to 400F degrees; lightly grease 9X13 inch baking pan. Cut tops from peppers, remove seeds and membranes; set TOPS aside. Cook peppers in boiling water for 1 minutes; drain peppers and plunge into ice water to cool quickly. Peel potato; and cut into 1 inch pieces; cover with boiling water and cook until tender about 20 minutes. Drain potatoes and mash (Nothing added). Heat oil in large skillet; sauté zucchini, garlic, basil and oregano. Add wine to skillet and cook for 2 minutes or until liquid evaporates; REMOVE from heat. Add to the skillet the mashed potato, 3 TABLESPOONS Parmesan cheese, cream cheese, sour cream and salt. Spoon cheese mixture into peppers and place into prepared pan. Sprinkle tops evenly with remaining 1 TABLESPOON grated Parmesan cheese and replace pepper tops.